Heading out to shop this weekend? Bath & Body Works is giving away a 2-oz Charmed Life body lotion from September 9-11. This is a $3.50 value and no other purchase is necessary. Print THIS COUPON to get yours. Want to Win a Free Burger? Go to RubyTuesdayRacing.com and enter to win. Sprint Cup® or Nationwide Series® you win too! Can I just say, "who is Brad K?" HEAD HERE for a free sample of Icy Hot from Walmart! Head HERE for a free sample of Joe Coffee. Click on "free bar" on left margin and get an emailed coupon! Print a coupon for a free Kid’s Meal at Friendly’s with the purchase of an adult entree. 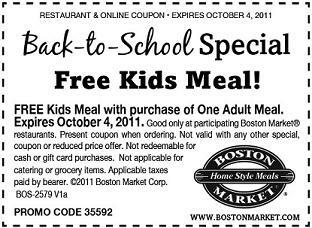 Through October 4, 2011, you can use this coupon to get a free kid’s meal at Boston Market with the purchase of an adult meal. Get a 25% off coupon from Ruby Tuesday!! 25% off your entire food purchase! Sign up to receive a coupon for 25 percent off your entire food purchase from Ruby Tuesday! Arts Cow is offering up 2 Custom Coin Purses for $4.99 Shipped with coupon code: MCP499199 You can add personal pictures, images, & font! You can apply Kohl’s coupon code TWENTY4MEat checkout to save 20% off your entire purchase at Kohl’s. You can stack the coupon with the Labor Day Sale and Summer Clearance. CLICK HERE to get a $10 off $25 Macy’s Purchase coupon valid 9/9 & 9/10 ONLY until 1 PM EST on both days. Currently amazon.com offers Gluten-Free Meals: The How-to Guide [Kindle Edition] as a free download! freebizmag.com offers COMPLIMENTARY Subscriptions to Guitar Player and/or Bass Player today! Eversave is offering up $5 for a 2 Year Subscription to Parents Magazine. When you sign-up for a new account, you will get a $3 Credit, making this ONLY $2 out of pocket. Then after you purchase you can “share the save” via email, facebook. or twitter, and get a $2 Eversave credit put into your account towards your next purchase. It’s like getting the magazine for FREE because you pay $2, but then get a $2 Eversave credit! REMINDER THIS IS STILL AVAILABLE! CLICK HERE and go to the Charlotte Russe Facebook page, “like” them and click “VOTE” and vote for someone’s picture, then you will be able to print a $5 off $5 coupon for any Charlotte Russe Store!! YAY! FREEBIES here we come! Free white strips for new sign ups! I just bought today's SaveMore.com deal for Smile Bright. I thought you might be interested in it too. $7 for Teeth Whitening Strips from Smile Bright ($29.99 Value) Shipping is INCLUDED! P.S. You'll receive $10 for signing up. Take this very SHORT survey, if you qualify (and I did), you will be sent a coupon for a free hair color kit! don't forget to check for restaurants in the areas you visit, vacation, attend school, and so on! Totally Turquoise and Loves Me collections are 60% off with shipping reduced to $5.95!